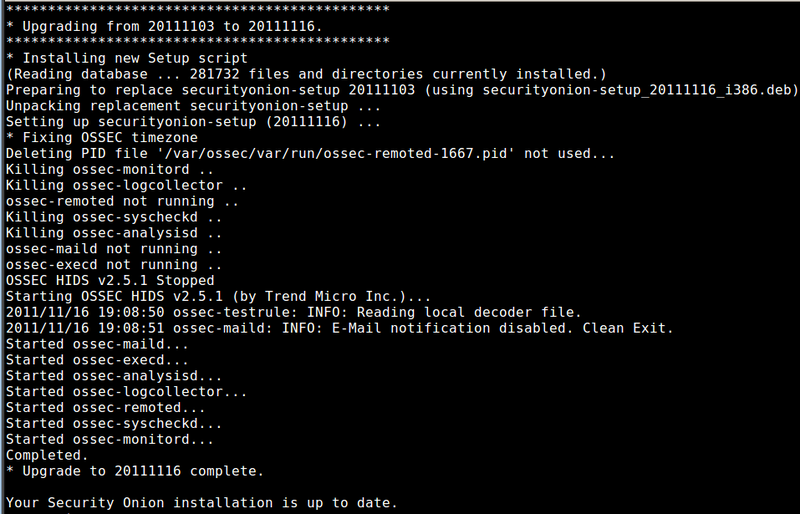 New users can download and install the new 20111103 ISO image using the instructions here. 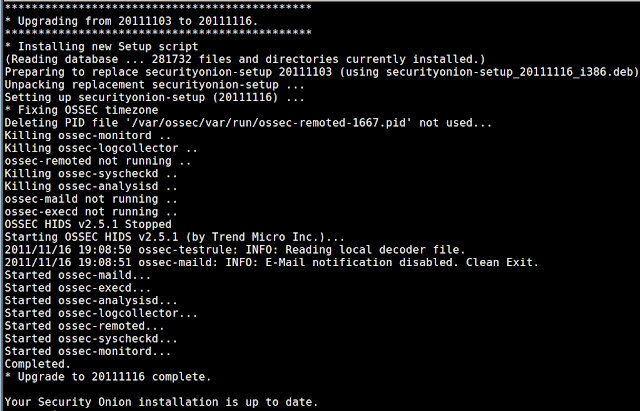 The step marked "Install Security Onion updates" will automatically install this update. If you don't wish to see these alerts, simply comment out those two rules in /etc/nsm/NAME-OF-SENSOR/suricata.yaml and restart Suricata. By default, suricata.yaml sets EXTERNAL_NET to "!HOME_NET". (The Snort default in snort.conf is "EXTERNAL_NET any".) If you'd like to change this, simply make the change in /etc/nsm/NAME-OF-SENSOR/suricata.yaml and restart Suricata. How do I edit suricata.yaml and restart Suricata? Modify /etc/nsm/NAME-OF-SENSOR/suricata.yaml using your favorite text editor. If you are already using Suricata and have customized your suricata.yaml file, please note that it will be backed up to /nsm/backup/20111127/NAME-OF-SENSOR/ and then overwritten with the new config file. Please copy any of your customizations (HOME_NET, etc.) 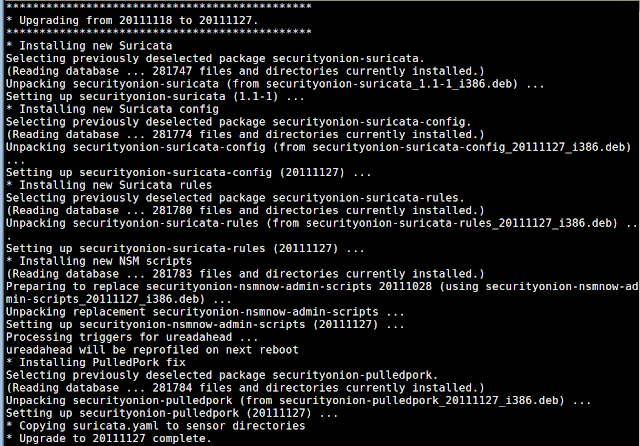 from /nsm/backup/20111127/NAME-OF-SENSOR/suricata.yaml to the production copy /etc/nsm/NAME-OF-SENSOR/suricata.yaml. This is a follow-up to my recent post "How do I receive an email when my sensor stops receiving traffic?". That post explains the core idea which I have since refined. The first rule just identifies "bandwidth" output and only logs it to disk (level 1 alerts do not generate email by default). The second rule is a child rule of the first and alerts/emails (level 7) when bandwidth is down to 0.000. This follows the same format as the "bandwidth" command, but pulls the count of received packets from ifconfig, waits 5 minutes, pulls the RX count from ifconfig a second time, and subtracts the first from the second to get the total number of packets received in the 5-minute interval. When the number of received packets drops to 0, rule 100004 triggers a level 7 alert, generating an email if configured to do so. New users can download and install the new 20111103 ISO image using the instructions here and then follow the In-Place Upgrade instructions below. How do I receive an email when my sensor stops receiving traffic? Recently, I logged into Sguil and noticed that a normally busy sensor had no current alerts. I looked at the full packet capture logs for the sensor and determined that it hadn't received any traffic from the tap in a while. We resolved the issue with the tap and started seeing traffic again, but I also resolved to create an automated notification for the next time this happens. Snort is already writing bandwidth statistics to /nsm/sensor_data/$SENSOR/snort.stats and we are going to use OSSEC to monitor the file and send email when the bandwidth drops to 0. We could possibly write an OSSEC decoder to have it parse snort.stats directly, but let's instead use OSSEC's process monitoring feature so that we can perhaps extend this in the future to use the Linux kernel's built-in packet counters. For now, we're going to rely on snort.stats. Rule: 100001 fired (level 7) -> "Bandwidth down to 0.000. Please check interface, cabling, and tap/span!" Security Onion has Snort's perfmonitor configured for 300-second intervals by default, which means that the value we're inspecting would be the average traffic for 5 minutes. My deployments have enough constant traffic that 0.000 for 5 minutes is a pretty good indicator of failure. YMMV!